Donald Trump is radically different from his predecessors as president of the United States. Bill Clinton, George W. Bush and Barack Obama pursued a completely different economic policy, pursuing America's hegemony in other ways. 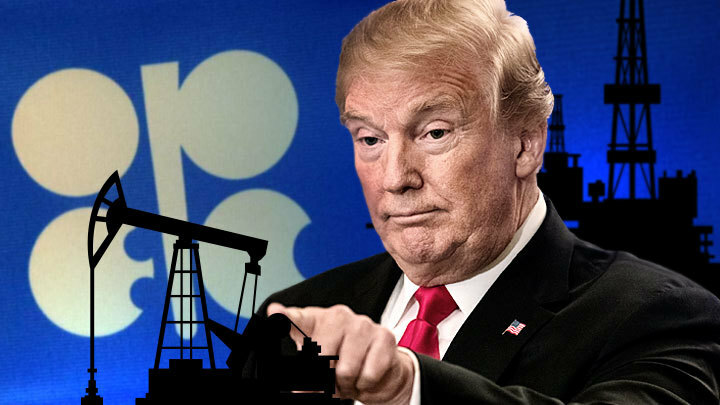 One of the main irritants for Trump, unlike his predecessors, is OPEC - an international oil cartel that balances the global oil market in the interests of both producers and consumers of “black gold”. In recent years, OPEC, together with its expanded membership, OPEC +, which also included Russia, has taken coordinated measures to reduce or increase oil production by exporting countries to stabilize prices. At the same time, the decision of OPEC + to reduce world oil production caused Trump's indignation, since low prices are beneficial for the United States. The President of the United States attacked the cartel dozens of times with criticism and threatened to take action. The United States has already reached the first place in the world in terms of oil production, which became possible due to the shale revolution, that is, due to the barbaric methods of extracting "black gold" using hydraulic fracturing, and not the classical way, as other countries do . Trump threw on the market large quantities of oil, and world prices, respectively, went down. However, this, in his opinion, is not enough, since OPEC will again cut production, and prices will rise. In February, the NOPEC - No Oil Producing and Exporting Cartels Act, or Anti-Cartel Act bill was passed to the US Congress. It should be Trump’s new weapon in the fight for low prices and the collapse of the global market in the interests of the United States. From March 11 to 15, Texas hosts the annual energy conference CERAWeek, which traditionally attracts the most prominent representatives of the industry and financial circles from different countries. On March 12, in the framework of the forum, closed negotiations between representatives of OPEC countries and American financiers were held. The meeting was addressed by the Minister of Petroleum of the United Arab Emirates and the ex-president of OPEC, Suhail Mohammed Al Mazrui. According to Bloomberg, citing the officials present, Al-Mazrui spoke out sharply against the NOPEC bill, which was reintroduced to Congress in February. The Minister warned that the adoption of this document threatens chaos and catastrophe in the global oil market. “Al-Mazrui told a group of American financiers that if the so-called NOPEC bill became law, the cartel would stop working. As a result, each participant will increase production to the maximum, which will lead to the collapse of oil prices, ”the agency reports citing the participants of the meeting. Low prices, indeed, would be a boon to the United States, and especially would have pleased Trump, who has repeatedly opposed OPEC actions to reduce production. However, Al-Mazrui warned that an American slate could be one of the victims in the process. Bloomberg also explains why the UAE Minister addressed this warning to the financial circles of Wall Street. The fact is that these circles are patrons of the companies that extract shale oil and allocate billions in loans to American drilling workers. Al-Mazrui’s position was then openly supported by OPEC Secretary General Mohammed Barkindo. Indeed, OPEC is what we are all used to. The organization has repeatedly proven its effectiveness; there is no doubt about its authority, authority and benefits. Why can only one American law put an end to it? Let's figure it out. Bloomberg in another publication reveals in detail the provisions of the NOPEC bill and explains why this document can really be compared with a bomb whose mechanism has already been cocked. The NOPEC bill was approved by the Judicial Committee of the House of Representatives on February 7 and is now awaiting a full vote of the lower house of the US parliament. It is noteworthy that the document was prepared jointly by the Republicans and the Democrats, which is now a rarity. Such a unity of supporters and opponents of Trump is usually inherent in the bills on sanctions against Russia. The main thing in this bill is as follows. NOPEC was prepared in the form of amendments to the very first antitrust law in the United States - the Sherman Act of 1890, which was used more than a century ago to destroy the oil empire of John Rockefeller. This law opens the way for lawsuits against monopolists on charges of oil price manipulation. It is also noteworthy that the White House has not yet expressed its position on the NOPEC bill, however, Bloomberg transparently hints that approval at the very top is not far off. What is the benefit for Trump? The fact is that the price of fuel at gas stations in the United States is very dependent on oil prices. If in Russia the price of a liter of gasoline by 73% consists of taxes, in the USA it is 56% of the cost price of crude oil. Trump in the election campaign of 2016 promised the Americans low fuel prices. And low fuel prices are the containment of inflation, the reduction of costs for transport companies and air carriers, the impetus for logistics and infrastructure, as well as assistance to farmers suffering from trade wars. OPEC is destroying these Trump plans, pushing prices up. At the same time, a little over a year is left before the new US presidential elections. It would be strange if there were no opponents of NOPEC in the USA. The risks are very high, and the members of OPEC would not have said so loudly about the harm of the new law. Among the opponents of NOPEC - the head of BP Robert Dudley. He noted that Trump should not allow excessive disruption of the oil markets, and the NOPEC law will have unintended consequences if it provokes lawsuits around the world. Dudley also noted that if it were not for OPEC, the exporting countries would begin to set production volumes at will, which would first cause a collapse in world oil prices and then, due to the reduction in oil revenues, it would stifle oil companies and fields. The head of BP noted that OPEC, in its own way, acts in the interests of American slate. The head of the US Department of Energy Rick Perry, who said that he considers OPEC's concern justified, also spoke out cautiously about NOPEC. Finally, the American Petroleum Institute and the US Chamber of Commerce warned that US companies could face pressure abroad due to NOPEC. They also noted that OPEC has already lost some of its influence in the world due to a sharp increase in the market share of American oil in the market. Thus, the final decision on the NOPEC is not, but the House of Representatives, which is controlled by Democrats, Trump's opponents, is already promoting this document. The Senate, which remains under the control of the Republicans and is ready to follow Trump’s will, should vote on it. The main problem is that for the sake of their personal interests and for the sake of election ratings, Trump can destroy the entire existing architecture of the world oil market.